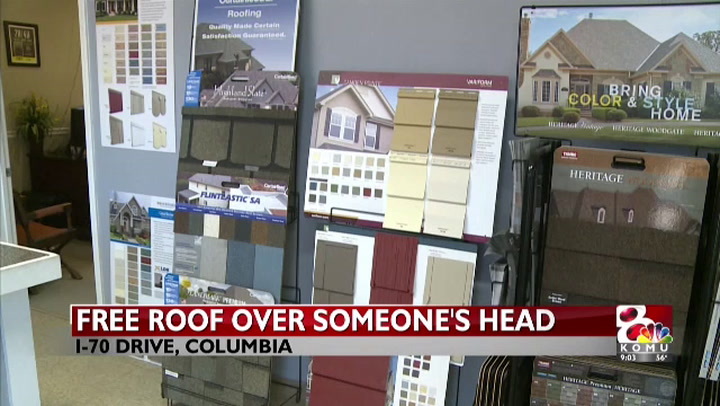 COLUMBIA - One of the most important parts of someone's home is the roof over their head, however, sometimes a roof just is not affordable. CoMo Premium Exteriors, a roofing company, has been around since 2010 and this year it is giving away a free roof to someone who deserves it. Owner and CEO Elias Abadi has always given back to the community through CoMo Premium Exteriors but this year they wanted to do a little something different. “As a company we always supported local charities but this year we wanted to do something more personal,” Abadi said. In the past he has gone to homes and accessed what it would cost for a new roof and, sometimes, the homeowners have not been able to afford it. He says that insurance companies occasionally cover the repairs but other times that just is not possible. “Insurance companies cover the roof by storm damage, hail or wind, but we get a lot of those people as well who just have a worn out roof and they may not be able to afford it,” Abadi said. Abadi said they don't have exact qualifications for the winner of the free roof. “We're looking for someone, a deserving person or a family in need, someone who makes a difference in our community,” Abadi said. The company's goal is to get as many nominations as possible and anyone can nominate anyone. “We want to at least make a difference for one homeowner this year,” Abadi said. Abadi is hoping to do this every year and hopefully multiple times a year in the future. The roofing company is accepting nominations until May 15. He will bring the top candidates in for a short interview and then will announce the winner the week of May 21. He said the application process is simple, you just go to their website and submit the form under the "Free Roof" tab.